The main character. He was once a highly-esteemed BPD investigator, until he lost his wife in an incident two years ago and resigned. Young was heavily injured in the incident, and doesn't really remember what happened. Soon after, he realized his accident gave him the ability to dive into the past by using the memories in left-behind items called 'mementos.' 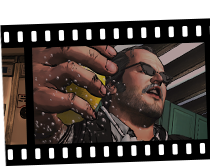 Currently, he works as a private detective out of his one-room apartment in Thompsonville. His wife's dying words were "Look for D..."
David's wife. He's called her 'Little Peggy' since even before they were married. Two years ago, someone murdered her in the bathroom. Some believe that the entire incident was revenge from a drug organization that Young was after, but the truth remained forever shrouded in darkness. 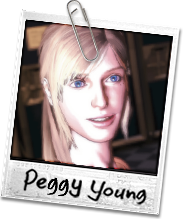 Peggy was pregnant when she was murdered, so she was never able to become a mother. Due to the complicated nature of the incident, the investigation soon spread to Young himself, which resulted in him resigning from the BPD. She was cheerful, outgoing, and could easily become friends with anyone. She was also family-oriented, and loved to cook... Except she wasn't very good, and often ended up causing accidents in the kitchen. She loved cats, and hated being alone. She also had an aggressive side, and enjoyed playing innocent tricks on people. 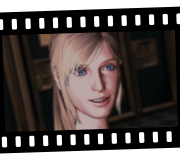 A mysterious girl who lives in David's apartment. She started living there after the death of Peggy, but it feels like she's been there for much longer. She's capricious, and usually just spends the day lazing around, but at night she becomes energetic, and gives Young massages, sits with him, and otherwise heals him. Sometimes, she goes outside to gather food and exterminate rats and small birds. 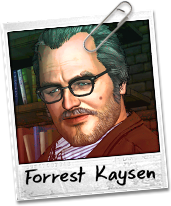 Like any veteran, Kaysen utilizes his extensive experience and takes a logical, common-sense approach to case-solving, in contrast with Young, who usually just goes on his gut feeling. 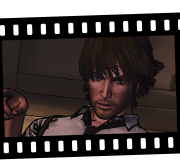 However, Kaysen lacks delicacy, and often has difficulties dealing with women. 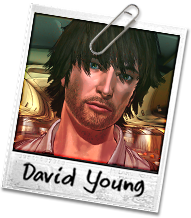 He especially has trouble with Diana, his long-time girlfriend, and Young's had to listen to much more of their drama that he'd like to.